Spring has arrived! The snow has melted and the decision has been made to open the course for the 2017 season on Friday, March 24. 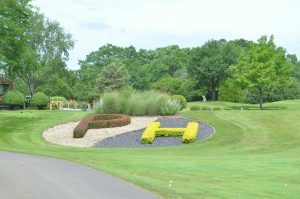 Visit PalatineHills.org to view and book available tee times. Palatine Hills is an 18 hole, par 72 course that has four sets of tees that provide a challenging yet enjoyable experience for golfers of all skill levels. Par 4 holes range in distance from 335 to 456 yards and par 3 holes range from 165 to 228 yards. Additionally, players must contend with 29 bunkers and water that comes into play on 10 holes. Even if it rains, carts are available with the continuous paths at Palatine Hills. Before and/or after you play this weekend, enjoy a meal or snack at the Clubhouse. Open Kitchens operates the restaurant in the Palatine Hills Clubhouse and their menu is available online. Kitchen hours are from 7:00am until course close.